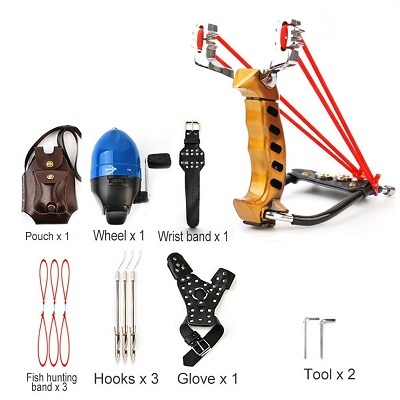 How to Select the Best Slingshot Bowfishing Kit? If you’re an avid bowfisher who loves getting outdoors to enjoy what nature gave us, having the right gear is important. After all, what’s the point in spending time and energy fishing if your gear doesn’t perform as it should? Therefore, when the time comes to upgrade or replace your current slingshot bowfishing kit, you should do your research. Not all bowfishing kits are made equally and purchasing one that’s not up to standard could prevent you from landing that big fish. Our buying guide reviews seven of the best slingshot fishing reel combos and kits on the market to help give you an idea of the level of quality you can expect. Review the features of each in comparison to the cost and you’re sure to find the best slingshot bowfishing kit for the money. Bowfishing kits are used for a range of fishing tasks. Equally as effective as a fishing rod, they can successfully be used to hunt carp, alligator, paddlefish, rays, and sharks just to name a few. The bigger the catch, the thicker your line weight needs to be. Every day in the United States, 10 people lose their lives in water. Knowing this sobering statistic should be enough motivation to ensure you’re as safe as possible around water. If you plan on heading out on a boat, wear a lifejacket and make sure someone knows where you are at all times. Where possible, take a fishing partner with you. In order to have the best velocity when you’re out bowfishing, it’s important that you match the correct reel with the best line and arrow. This can vary depending on the fish you’re looking to catch, the water you’re fishing in, and the reel. Spin cast reels offer the best speed and precision. The standard bowfishing kit includes a slingshot, a bowfishing rest, a fishing reel (with or without line) and a flashlight rack. Some also feature arrows and ammo but these can be sold separately as well. Most bowfishing kits come without line because your desired use for your new kit could differ from someone else. As a rule of thumb, fishing line is either made out of braided nylon, spectra or dacron and has a line weight of between 80 and 600. You can also choose a fishing reel to suit your task as well, with the most popular being retriever, spincast and hand wrap reels. The hand wrap reel has a circular spool that you manually wrap your line around, while a retriever reel holds the line in place. The most popular option for bowfishers is the spincast reel. Avid outdoor enthusiasts with advanced skills prefer spincast reels due to the higher speed and precision on offer. One of the most vital parts of any bowfishing kit is the arrow. Most are made of either fiberglass, carbon fiber or solid aluminum. The aim is to not travel far but to propel towards a target with great force. The barbs on the arrow are also designed to remain stuck in the fish until unhooked by the bowfisher. While fishing technique plays a huge part in your bowfishing success, so too do the various components of your bowfishing kit. Firstly, the best way to catch a fish when bowfishing is by not being afraid to get wet. The closer you are to the fish, the easier it is to use your bowfishing skills. While fishing from the shore or on a boat is an effective bowfishing method too, you may find that being prepared to walk out to the depths can land you that big fish far more effectively. Secondly, you should always aim low. Often, bow fishers lose their opportunity to catch the big one because they’re aiming too high. They see a fish in the water and shoot their arrow wide. Often, what they are seeing is refraction, where the fish appears to be higher than it actually is. Aim lower and you’re more likely to hit your target. A slingshot that shoots arrows can be on-par price-wise with a top-rated fishing rod. They are equally as effective, but allow you to have so much more fun! Expect to spend between $70 and $100 for a top-rated bowfishing kit when you buy online. It’s made out of durable aluminum and ABS plastic. It comes with an adjustable arrow brush and fishing reel. It can be used for shooting fish and targets. It’s versatile and can be used for short and long distance aiming. The folding wrist lock offers plenty of support. It’s easy to steady your aim. The handle grip is molded for better ergonomic support. It doesn’t come with any arrows. Dimensions: 7 x 7 x 4.5 inches. QHow many bands does it have? QHow does it attach to your arm? AWith domes on the wristband. 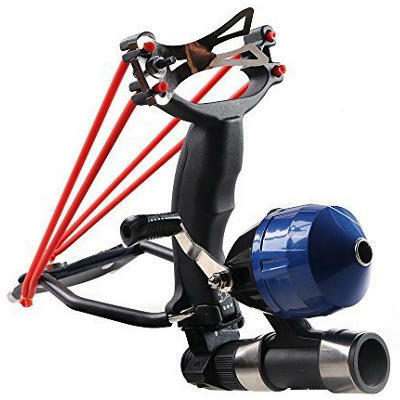 If you like both archery and bowfishing equally, this slingshot fishing reel combo will appeal to you. Not only can you practice target shooting with ammo balls, but within seconds you could be catching that big fish with arrows from the same tool! It’s versatile, durable, and exceptionally easy to use. The only downside to this otherwise great product is that it doesn’t come with arrows. Check out what other people who purchased this product think about it. Read Popshot slingshot bowfishing kit reviews. It’s made of high-grade aluminum alloy and ABS plastic. It’s versatile and can be used for target practice and bowfishing. It’s easy to change it from being a slingshot to a bowfishing tool. It’s one of the most affordable for sale online. It doesn’t come with arrows or ammo. Dimensions: 6.3 x 3.9 x 1.38 inches. QWhat is the maximum initial velocity? A120 meters per second with a 7mm steel ammo ball. QHow many rubber bands does it use? Whether you’re just starting out or you’re after a second bowfishing kit, this Toparchery set is a good option. While it doesn’t come with ammo or arrows, it does come with a fishing reel when many others don’t. 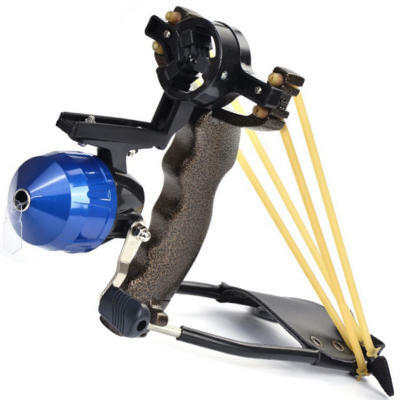 It works well, is easy to set up, and the changeover from bowfishing to using the slingshot is easy. It’s also one of the cheapest on the market when you choose to buy online. Check out what other people who purchased this product think about it. 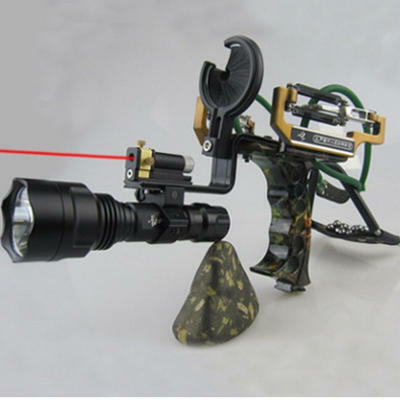 Read Toparchery slingshot bowfishing kit reviews. You can choose from five different kit options, other than A-Gold. It’s made of high-quality alloy. It comes with a 180-day guarantee. The A-Gold set doesn’t come with ammo or arrows. QWhat is it best suitable for? ABoth target shooting and hunting. The A-Gold set from Firelong is a great kit for someone who’s either just starting out in bowfishing or needs a high-quality spare tool. While the A-Gold set doesn’t come with ammo, it does come with everything else to get you outside and having fun. It’s well-priced, the slingshot itself looks great, and it’s very comfortable to use. Check out what other people who purchased this product think about it. Read Firelong A-Gold Set slingshot bowfishing kit reviews. The arrow rest can be removed easily to convert the tool back to a slingshot. It has a good draw weight. It’s suitable for target practice and for hunting. It’s very simplistic in design. It’s essentially a bare tool and doesn’t come with any accessories such as arrows, ammo balls or a fishing reel. It costs a lot to buy, considering it doesn’t come with any accessories. QWhat is the draw weight? QDoes the wrist brace fold? QCan you attach a fishing rig to it? If you already own all the accessories needed for hunting or recreation, this Ranger slingshot would make a nice spare slingshot. It’s durable, versatile and very easy to use. However, the price tag is very high for what’s actually on offer. For the money, you only get an arrow rest and the slingshot body. There are several other options on the market that offer the full package for roughly the same amount. Check out what other people who purchased this product think about it. Read Ranger slingshot bowfishing kit reviews. It’s made out durable materials. It has stainless steel components to prevent it from rusting. It spring accelerates for greater force. It has a special magnet design and a protective hand guard. The handle grip is comfortable. It comes with both the fishing reel and broadheads. It’s suitable for competition and recreation. You can’t choose which color reel you’d prefer. Rubber band for shooting ammo. QWhat color is the slingshot? QHow many bands does the slingshot use? 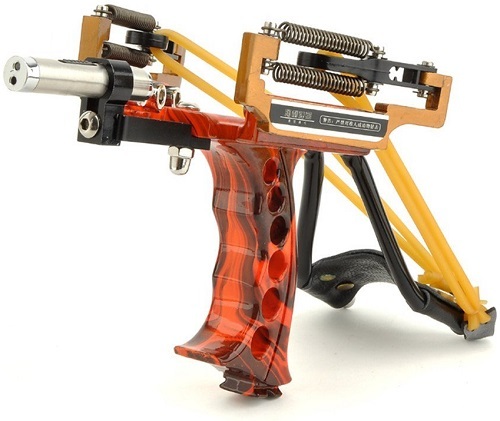 Featuring everything you need to hit the ground running, this well-made slingshot is perfect for both competition and recreational use. Whether you’re wanting to hook that big fish, or you’re taking care of pests, this is the tool for the job. It’s well priced on the market, it’s comfortable to use, and it’s exceptionally versatile. It’s easily one of the best slingshot bow fishing kits for the money. Check out what other people who purchased this product think about it. 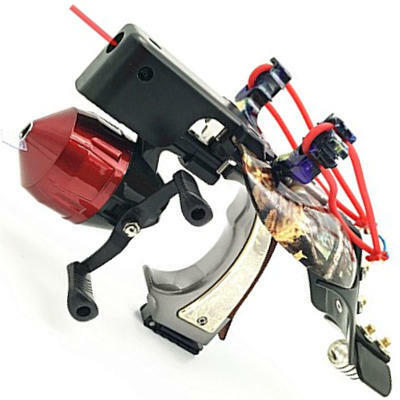 Read Smarty slingshot bowfishing kit reviews. It can be used for both shooting ammo balls and arrows. It teaches a lot of helpful skills such as attention, aim, and eyesight. It’s suitable for casual or competition use. It’s well priced on the market. You can’t choose which color you get. It doesn’t come with arrows. QIs it suitable for use with short or long arrows? QWhat arrow is best used with this bowfishing kit? AA fishing arrow between 29 and 31 inches long. If you’re into the great outdoors, there’s no better way to experience two premium activities than with this kit. Try your hand at archery, give target practice with balls a try, or why not catch a fish? The options are endless and the best part is, it’s a really inexpensive kit. Featuring everything you need to get started, except for the arrows, it’s easy to consider this kit the best slingshot bowfishing kit for the money. Check out what other people who purchased this product think about it. Read HBG slingshot bowfishing kit reviews. 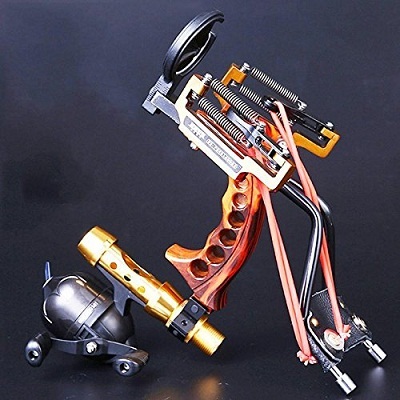 It’s a durable and effective slingshot bowfishing kit for professionals. It comes with a range of accessories. The flashlight has a good range. It doesn’t come with a fishing reel. Instructions for use are poor. 2 sets of 3-fold rubber bands. 2 sets of 2-fold rubber bands. A bag of steel balls. QWhat is the shooting distance? QWhat arrows are suitable for use with this slingshot? QWhat can this slingshot kill? ABirdlife, fish and small animals such as squirrels and rabbits. 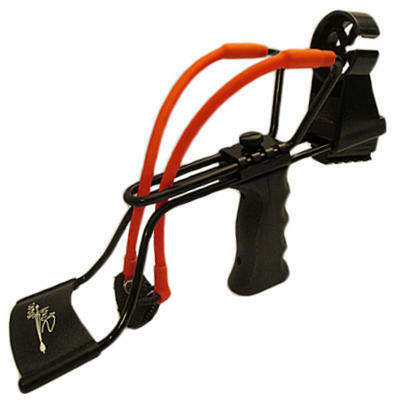 If beginner slingshots are not advanced enough for your capabilities, you can step it up a notch with this top-rated Yancorp slingshot. Designed for professionals in both archery and bowfishing, it’s durable, effective and easy to use. For the price, you also get a lot of bang for your buck. Unfortunately, it doesn’t come with a fishing reel or arrows. Check out what other people who purchased this product think about it. Read Yancorp slingshot bowfishing kit reviews. Where to Buy Slingshot Bowfishing Kits? A trip to any hunting and fishing outlet will allow you to come out with a brand new bowfishing kit. However, expect to pay more for the privilege. When you choose to purchase any particular model from any manufacturer, online, you are able to get the best deal. In many cases, you can even choose to opt out of receiving certain products if you already own them, or add more in as well. Choosing to buy your slingshot bowfishing kit online is also convenient in the respect that you can have it shipped directly to your door.